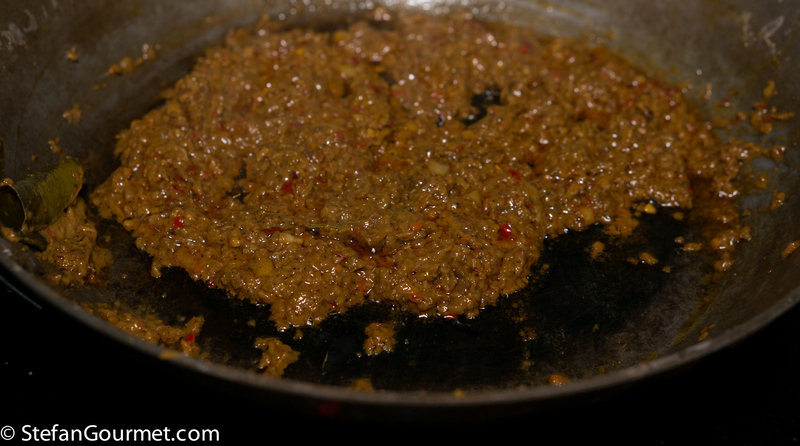 Beef rendang is the national dish of Indonesia. 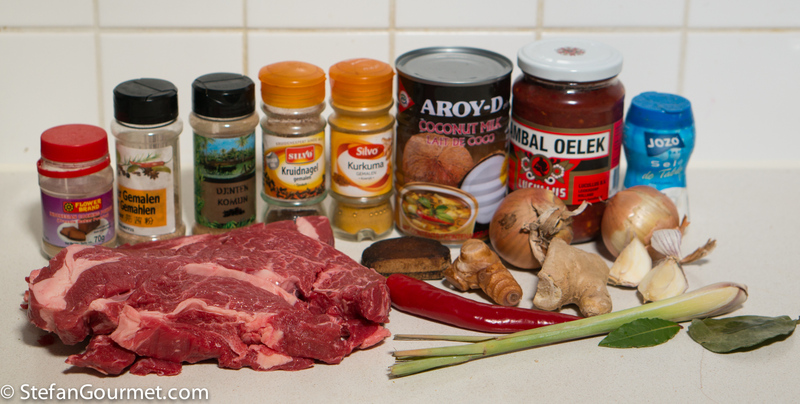 I’ve already blogged my recipe for Rendang many years ago. 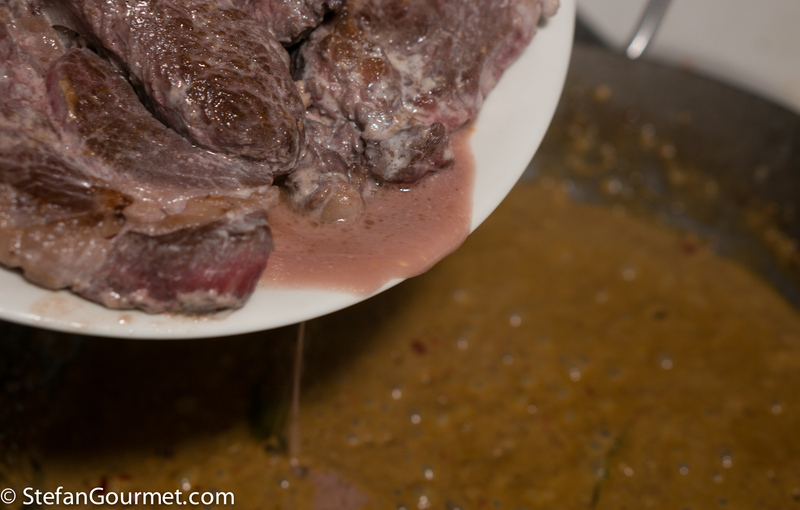 Back then, I didn’t think it made sense to prepare it sous-vide, as an important part of making Rendang is reducing and browning, which does not happen in sous-vide cooking. However, since then I have learned a lot about hybrid approaches, where the sauce is reduced and separately from the meat, which is browned briefly and then cooked sous-vide with the sauce that has already been reduced, such as in my sous-vide version of Ragù alla Bolognese. 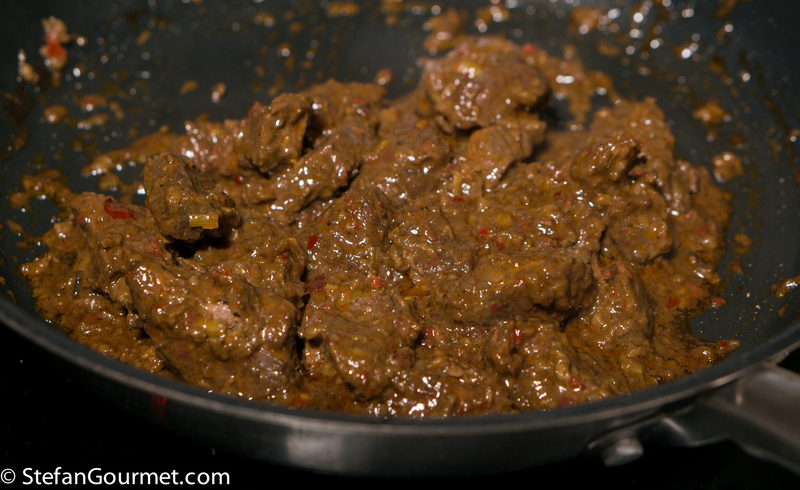 And so it was time to try and make beef rendang sous-vide using a similar technique. And guess what? It turned out great! 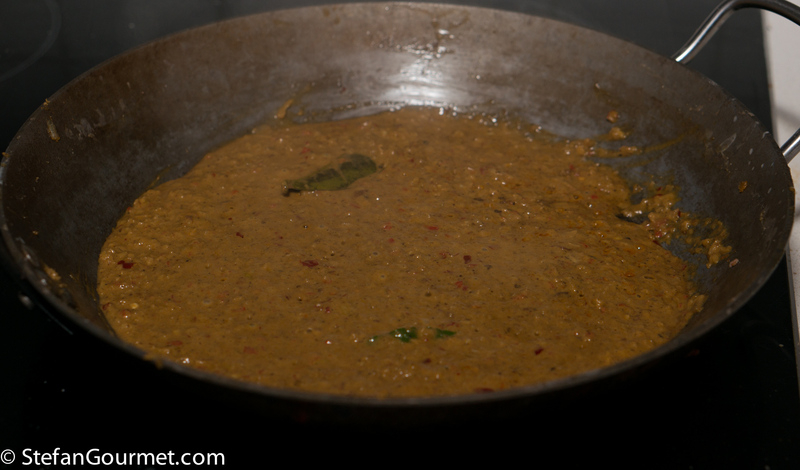 And it takes less tending than regular Rendang, which requires quite a bit of stirring, especially towards the end. I’d have to do a side-by-side comparison to confirm, but the tenderness and juiciness of the meat seems better than with regular Rendang, and the sauce just as good. Another advantage of making this sous-vide is that you can use less coconut milk. 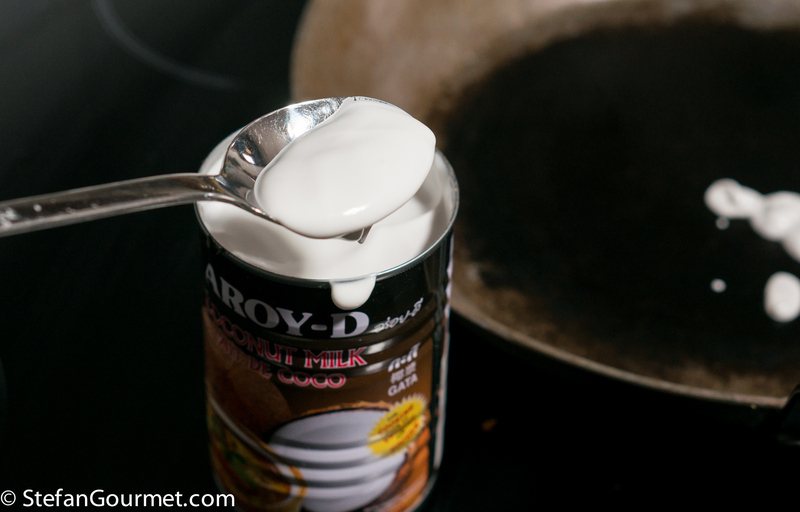 If you consider there is 80 grams of fat in a single can of coconut milk (that is about how much fat you should eat in a day altogether), it is nice that for the sous-vide recipe you can cut the amount in half. 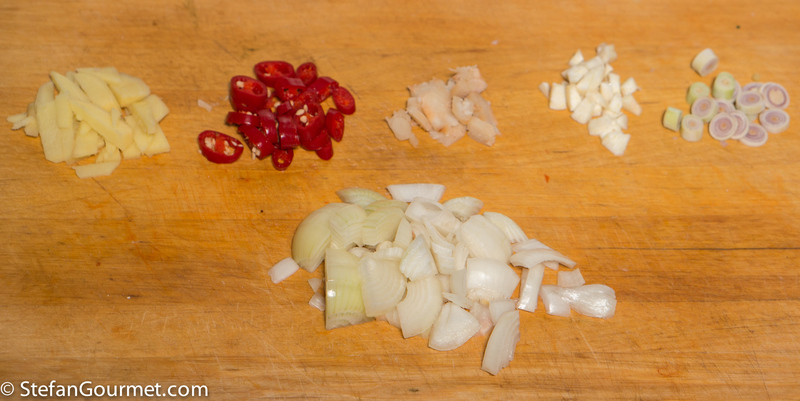 Chop the ginger, chilli, galangal, garlic, lemongrass, and onion. 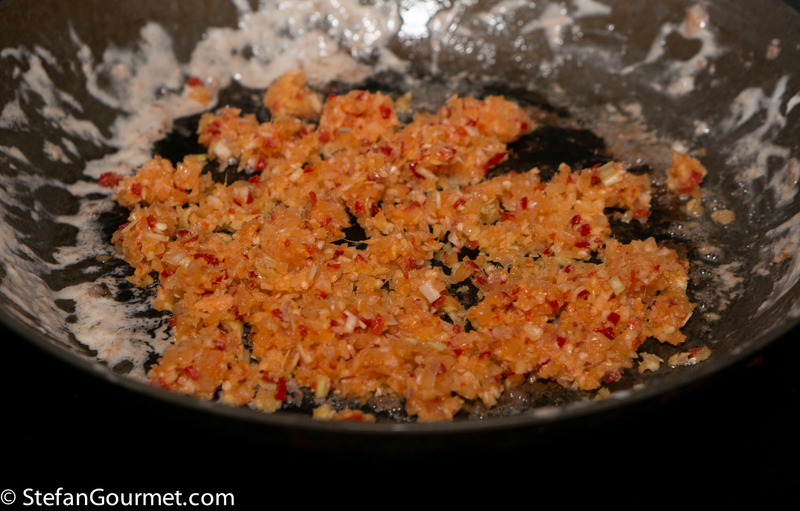 Then process all of this together in the food processor to make a bumbu. This is the Indonesian equivalent of what is called curry paste in Thai cooking. For a more traditional approach, you could also use a mortar and pestle. Season the beef with salt. Do not shake the coconut milk. 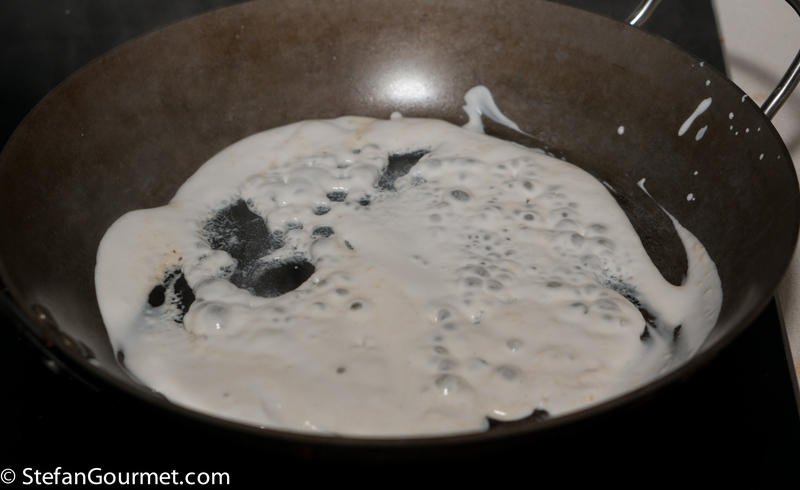 Scoop off the thick white coconut cream that floats on top, and put it in a frying pan. 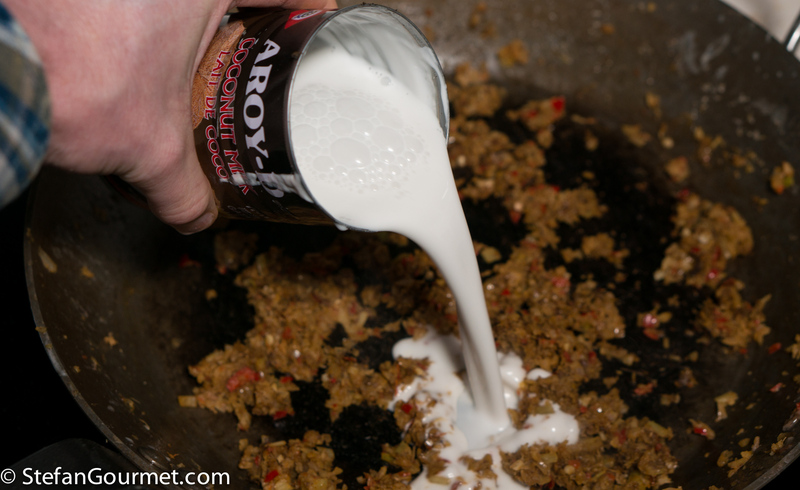 Heat the coconut cream until it starts to ‘break’. …for a couple of minutes per side. 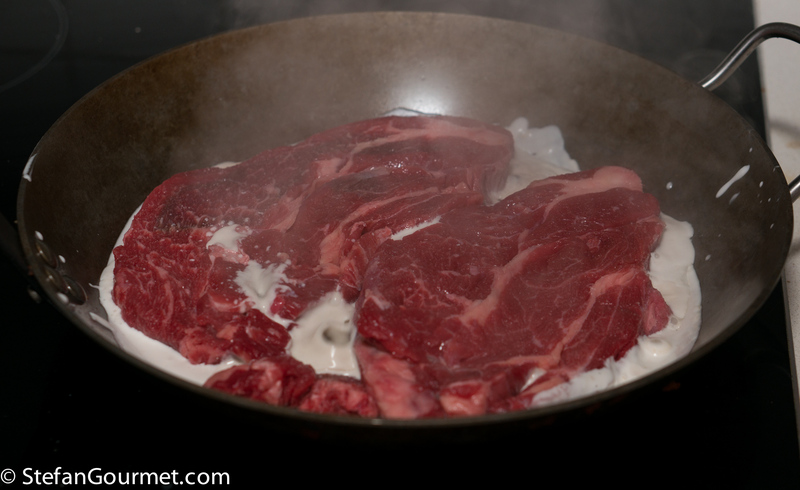 This is just to brown the beef a little; it should remain raw inside. 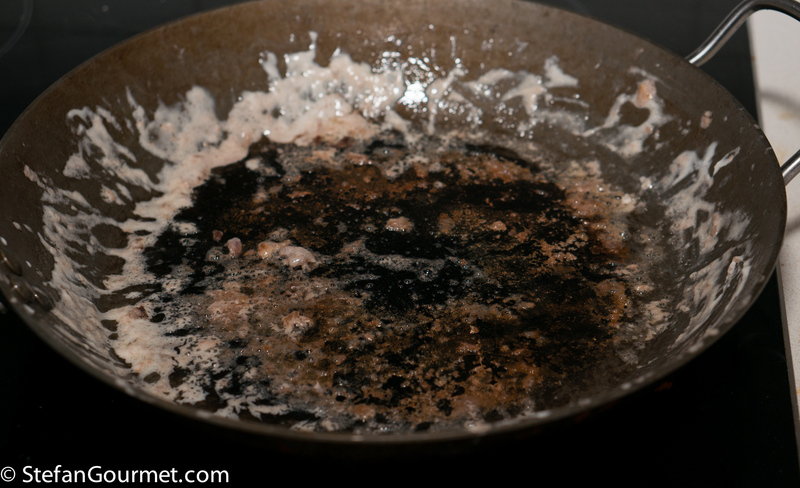 Take the beef out of the pan and put it on a plate. 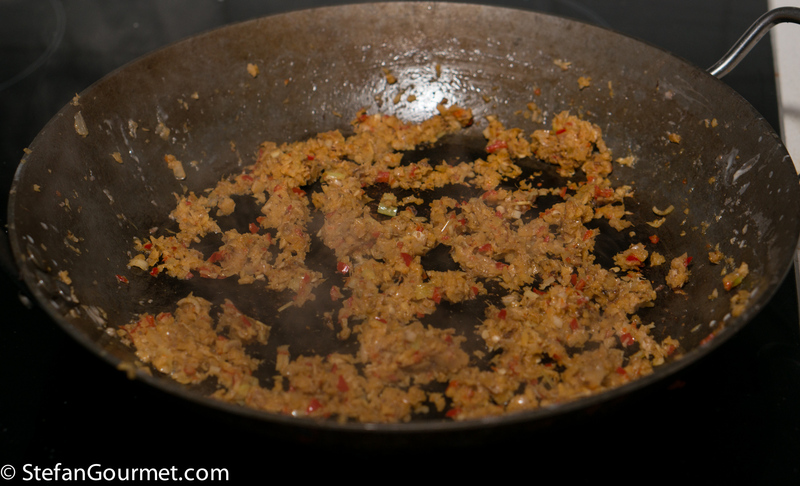 …and cook over medium heat, stirring, until the bumbu is golden brown. 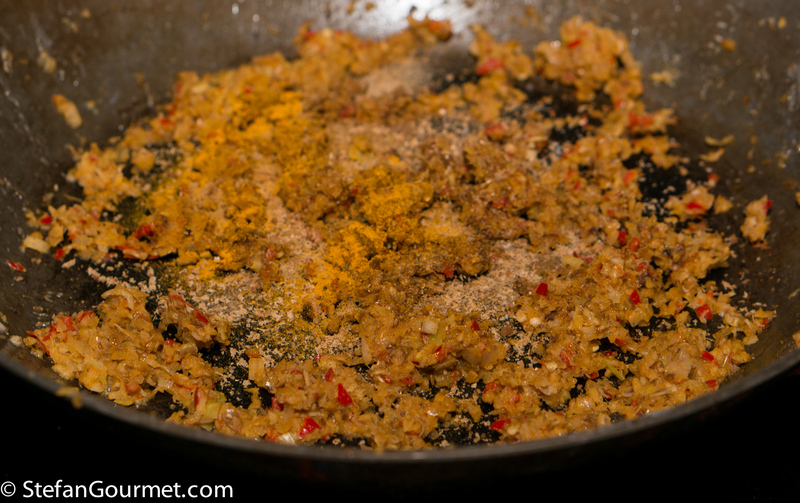 Now add 1/2 tsp ground cumin, 1/2 tsp ground coriander, 1/8 tsp ground cloves, 1/8 tsp ground turmeric, and 1/8 tsp trassi, and stir for another minute. …and the bay leaf and lime leaf. Bring to a boil and allow to reduce, stirring regularly. 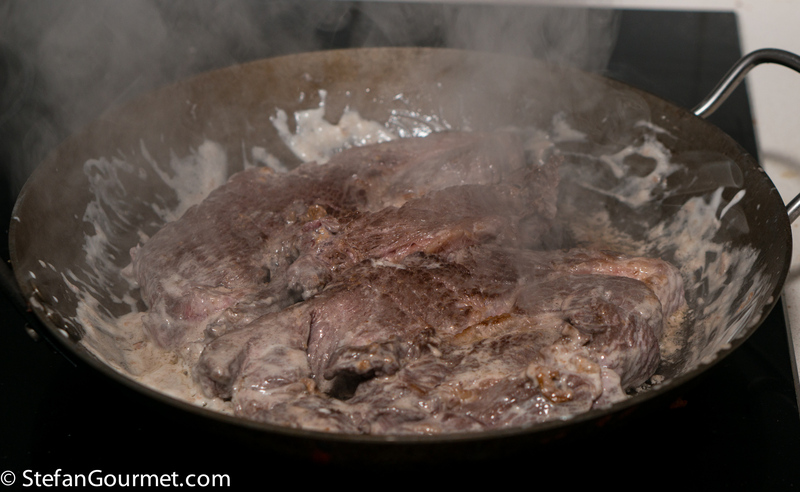 Add the juices that will have leaked from the meat. …until it very thick and the color has darkened. This will take about 15 minutes. Turn off the heat and remove the bay leaf and lime leaf. 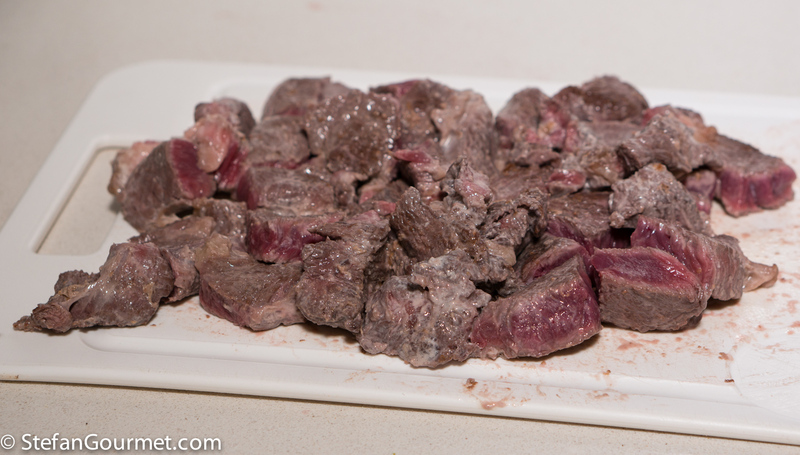 Cut the beef into cubes. As you can see, it is still raw inside. 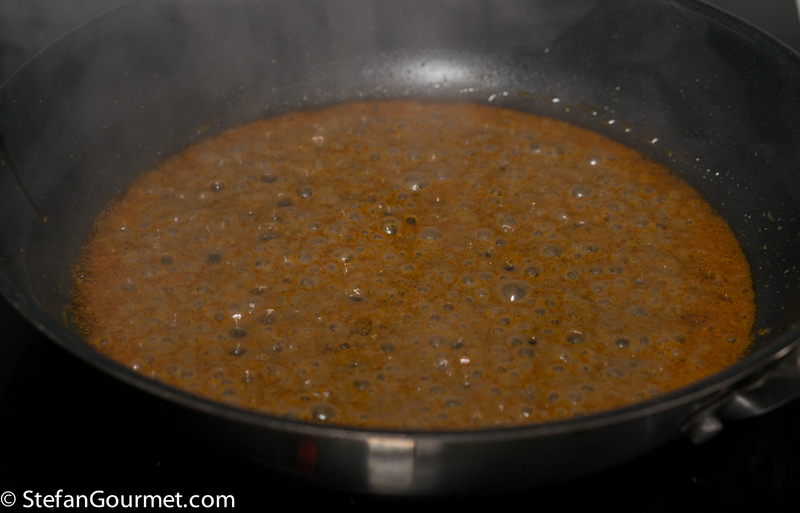 …and stir until the beef is coated with the sauce. 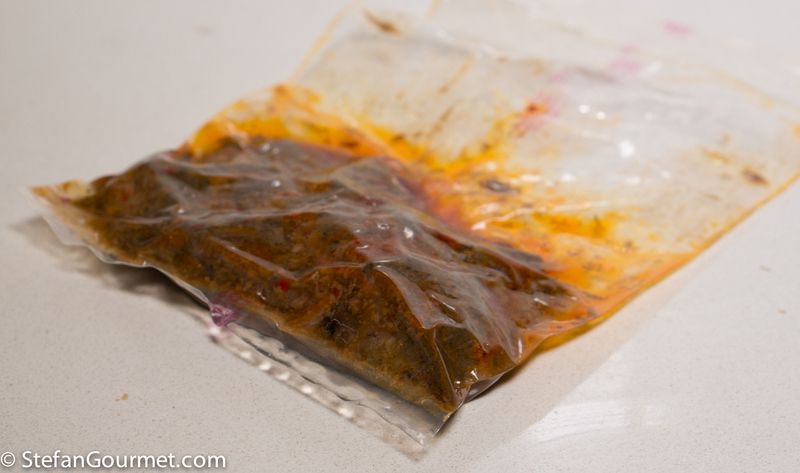 If using a ziploc bag, you can now put the meat and sauce into a bag and close it with the water displacement method. 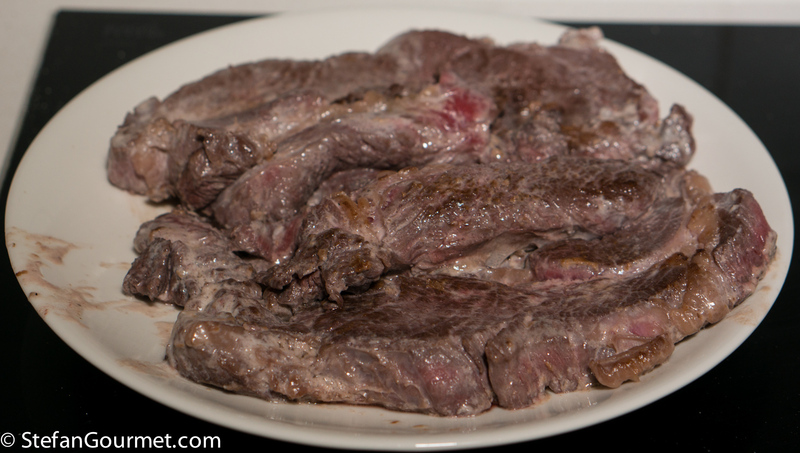 If using a chamber vacuum sealer, allow meat and sauce to cool off completely before vacuum sealing. 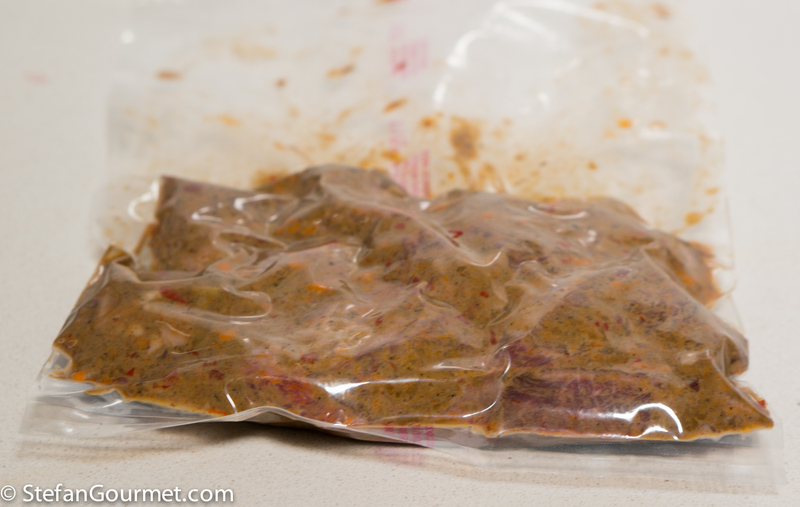 After cooking sous-vide, you can chill the bag in ice water and freeze it. Simply reheat directly from frozen in the sous-vide at 74C/165F for a couple of hours. 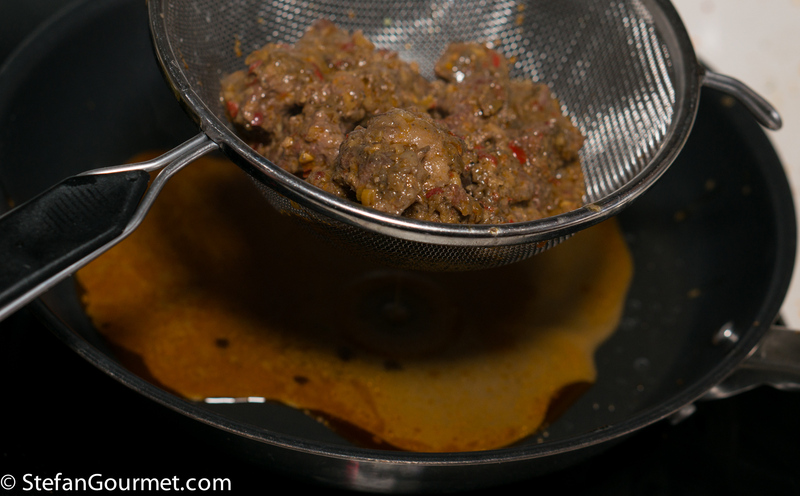 To serve, open the bag and strain the juices into a pan using a fine sieve. Reserve the beef. 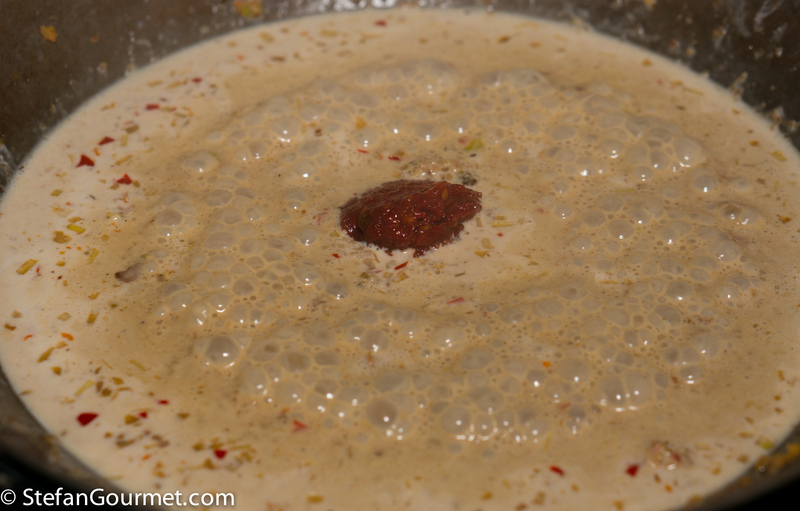 Bring the juices to a boil and allow to reduce over medium heat. 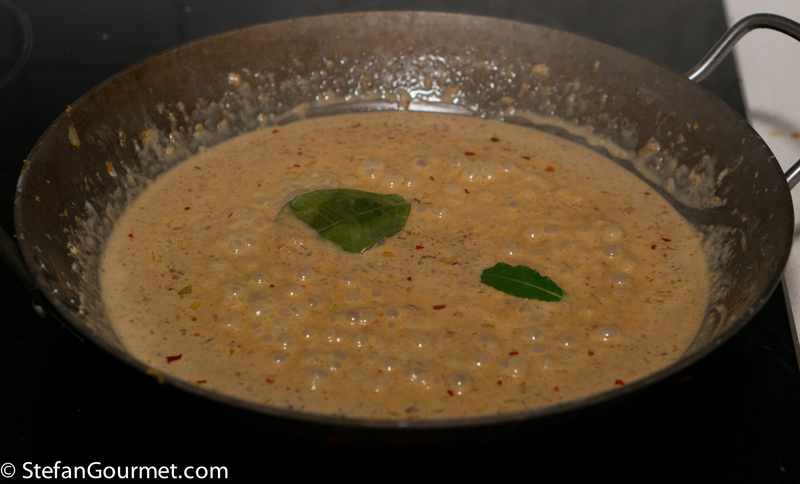 When the sauce has thickened, season it to taste with kecap manis. 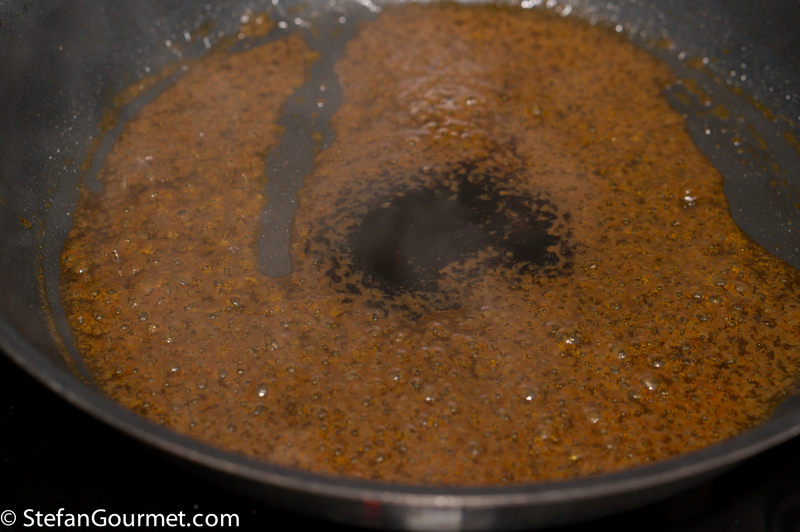 There are also recipes that call for adding salt and palm sugar, but using kecap manis instead (of which salt and palm sugar are important ingredients) has two benefits: it adds some more color and it adds some more flavor. 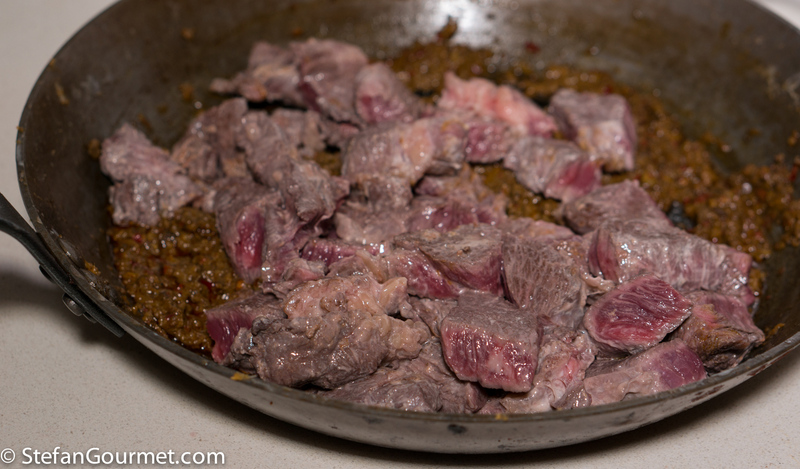 …and stir to coat the beef with the sauce. Bring to a boil, then turn off the heat at once. 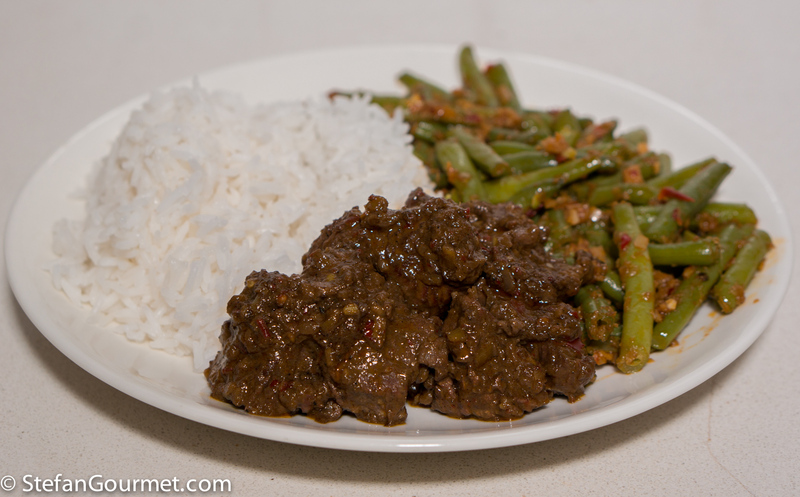 Serve with white rice and Indonesian green beans. I thought what a home cook from Genoa would do with leftover chard stems, and that is how I came up with this contorno(side dish) of baked chard stems. 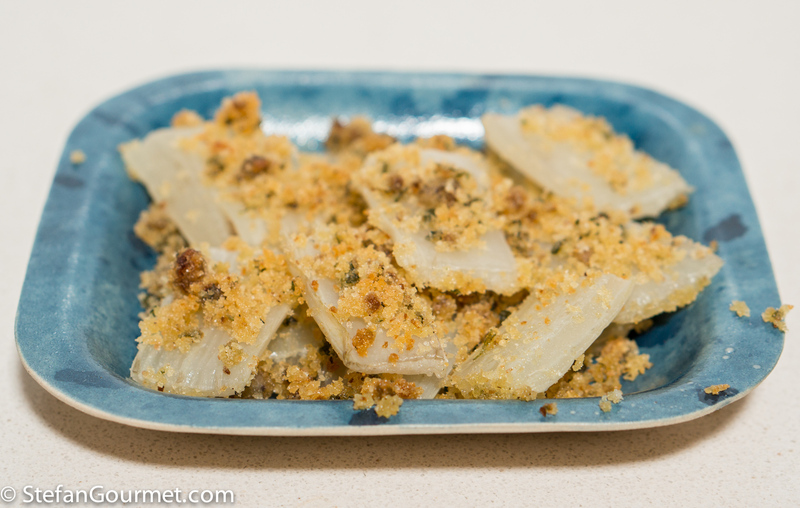 To add some flavor and texture, I topped the chard stems with breadcrumbs flavored by anchovies, garlic, and marjoram. Really interesting approach. It looks lovely. 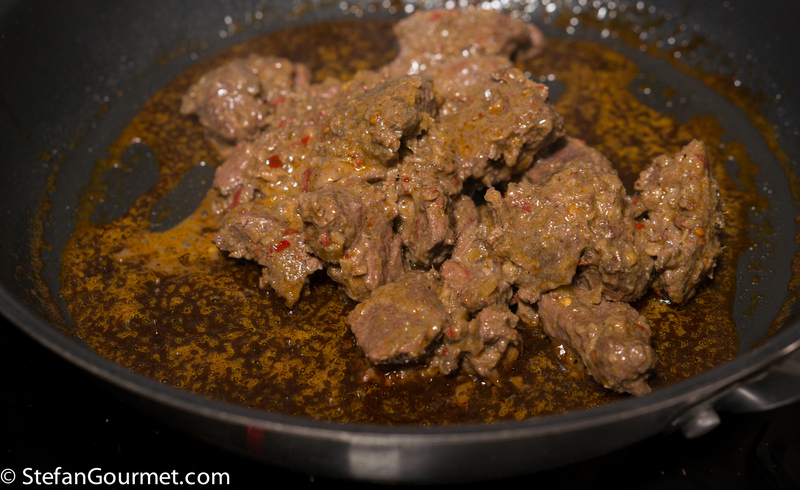 I cooked a “traditional” venison rendang a couple of weeks ago. It was delicious. I will post it soon. Interesting! My long-time rendang recipe methinks originated in Malaysia . . . yours looks simpler and will be tried, Not sous-vide at the moment 🙂 ! This dish looks as flavourful as it sounds. We love many dishes of Southeast Asia and this one looks like we would love it too. Interesting preparation with sous-vide, sadly I don’t have such appliance so I will refer to your original recipe that you kindly linked in this post. 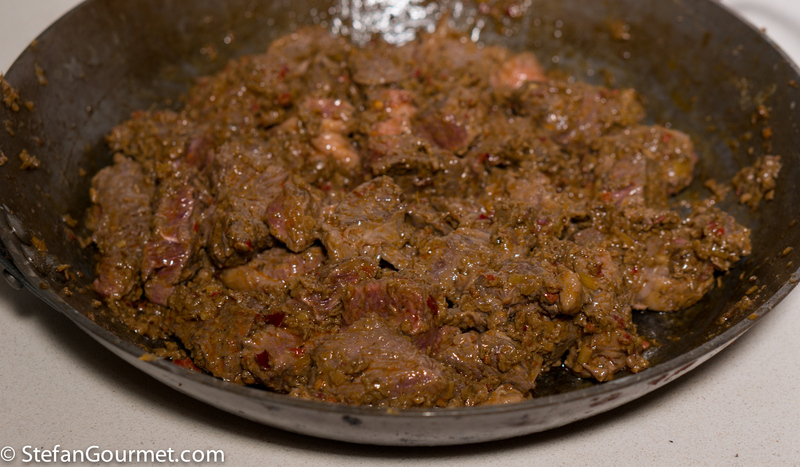 If you like spicy food and have never tried Rendang, you should definitely prepare it. It is the national dish of Indonesia for a reason!